I confess it! I was curious. I saw Wizard of Oz Scanimation book and I had to take a peek. New from Workman Publishing, it is very similar to their other Scanimation titles such as Gallop! or even Star Wars . It's a curious book for fans of this beloved classic film. (I guess you can say I'm a fan.) Totally love Judy Garland's performance in this fabulous story. The Scanimation book, Wizard of Oz , features ten scenes from the film. Of course it must begin with Dorothy clicking her heels in those iconic ruby red slippers and it ends with the face of the Great and Powerful Oz. Each page spread contains a Scanimation, a short quote and a short description of what is represented on the page. It's just a fun book, what else can I really say? 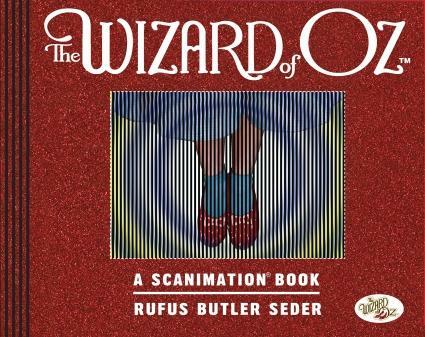 For any fan of The Wizard of Oz, this book will no doubt catch your eye and make you curious. It's red and sparkly. You can't miss it. Thanks, Workman Publishing, for shooting a copy of this one my way. I had to look up what scanimation was -- I am still not sure I entirely understand. Will have to peek at this if I ever see it in person. That DOES look fun! Looks like a great gift for my Kiana who is turning four in a few short weeks (gulp)!